Heat oven to 375°F. Grease large cookie sheet. Cook sausage in 10-inch skillet over medium-high heat, stirring occasionally, until no longer pink; drain. Stir in pizza sauce and oregano; set aside. Stir Bisquick mix, cheese spread and hot water until soft dough forms. Place on surface sprinkled with Bisquick mix; roll in Bisquick mix to coat. Shape into ball; knead 5 times. Roll into 14-inch circle; place on cookie sheet. Spread sausage mixture over crust to within 3 inches of edge. Fold edge over mixture, leaving center open. Top with bell pepper rings. Sprinkle with cheese. 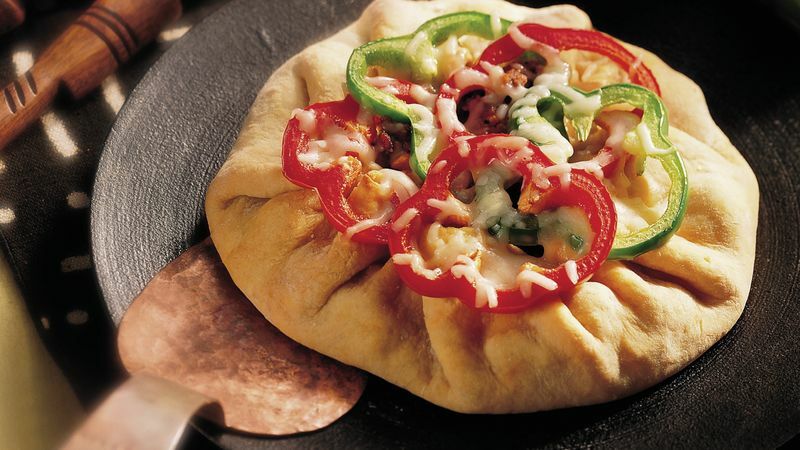 Bake 23 to 25 minutes or until crust is light golden brown and cheese is melted. Use spicy pork sausage for an extra-zesty kick to this savory pizza pie. Fold the circle of dough in half or fourths to easily transfer it to the cookie sheet, then gently unfold on the cookie sheet. Find jarred process cheese spread in the grocery store near packages of other shelf-stable cheeses.